Will the Carl Vinson strike group attack North Korea? The USS Carl Vinson (pictured above) was recently redirected towards the Korean Peninsula. In all likelihood, the U.S. Navy will not launch a pre-emptive strike on North Korea’s nuclear weapon facilities, writes Asia expert Vasily Kashin. He believes that U.S. President Donald Trump wants to have China on his side when it comes to more serious measures against North Korea. 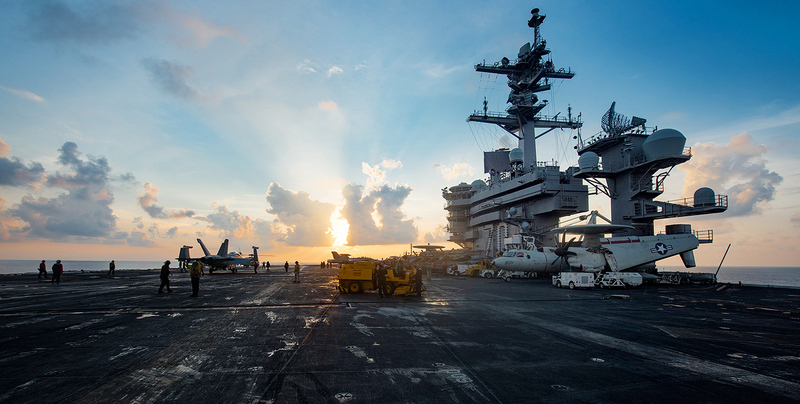 On April 10 the U.S. Navy’s Carl Vinson strike group suddenly changed course from Australia to the Korean Peninsula amid concerns that North Korea could soon conduct a sixth nuclear test or more missile launches. The move gave more ground to U.S. President Donald Trump's threat of unilateral action to solve the problem of North Korea's nuclear program. North Korean state media warned of a nuclear attack on the United States if there was any sign of American aggression. Statements made by the U.S. Secretary of Defense James Mattis show that the approach of Carl Vinson strike group to the shores of Korea was a show of force in connection with the deterioration of the situation on the peninsula. Demonstrations of force in response to North Korea's nuclear tests such as military exercises were carried out in previous years as well, but the latest action happened under very different circumstances. It began shortly after Washington’s surprise cruise missile attack on a Syrian airfield in Shayrat. The strike was held in the middle of Chinese leader Xi Jinping’s visit to the United States. One of the apparent goals of the strike was to impress the Chinese leader! This was followed by a series of bellicose statements by U.S. officials, including Donald Trump on Twitter, indicating American willingness to undertake unilateral violent actions against North Korea. Apparently, the U.S.’s goal was to pressure China to back new UN Security Council resolutions against North Korea that Washington is preparing at the moment. These resolutions are expected to call for an almost complete trade embargo of that country, including a ban on international shipping, an oil embargo, and a ban on the export of North Korean labor. The ban on the export of North Korean labor directly affects Russian interests. Russia employs tens of thousands of North Koreans. There is no indication that China has changed its previous position and is ready for such a total blockade of North Korea. The lack of progress in agreeing to new UN sanctions, especially if the discussion will be held after new provocative North Korean actions (for example, missile or nuclear tests, timed to Kim Il sung's birthday, April 15), would mean that American policy suffered a major defeat. Such a defeat would not go unnoticed in the region and is likely to affect the future behavior of China, North Korea and other players. Trump has already been forced to give up on his radical idea of a trade war with China, though he has probably managed to extract some limited concessions from Beijing (for example, on the issue of beef exports to the Chinese market). He has repeatedly acknowledged the principle of "One China," after he himself declared that the principle was a subject of bargaining. He ended up getting nothing in return. The lack of progress on the North Korea issue only confirms his reputation as an unpredictable amateur, not able to follow through or back up threats with action. Even if China agrees for the radical strengthening of sanctions on North Korea, the question arises about its willingness to comply with them in full, as has been the case with previous decisions of the UN Security Council. In its new strategy, the United States wants keep the “military option” to solve the Korean question, but as a last resort. But obstacles that come in the way of this option will continue to increase. The main obstacle is the vulnerability of South Korea and Japan – regional allies of the U.S. – for reciprocal actions by Pyongyang. What stops Moscow and Beijing from forming a military bloc? The strategy of the Barack Obama administration in the Asia-Pacific region, aimed at limiting Chinese influence, was also not very successful. However, Trump's attempts to change the situation by bringing in his own “valuable ideas” which were clearly provocative in nature, only worsen the situation in the region and give confidence to the U.S.’s opponents. In general, Trump has not justified any expectations for some qualitative changes in American foreign policy. The new American President does not have a strong foreign policy team in place to make any qualitative changes in its relations with countries such as Russia and China. The United States will continue to follow the old course, but with an unprecedented disruption of its own state apparatus. It stands to gradually lose its global authority. Vasily Kashin is a senior research fellow in the Moscow Based Institute for Far Eastern Studies and in the Higher School of Economics. Views expressed are personal.